Hydraulic Elevators are lift systems that use a hydraulic piston to raise and lower the elevator car. Hydraulic Elevators are typically used for low-rise and mid-rise buildings below 6 stories due to the elevator system’s slower speed and limited piston lengths. The hydraulic piston sheave and cylinder is located below the elevator pit and must be at least the overall rise plus 4’-7’ | 1.2-2.1 m. Hydraulic Elevators have a low initial cost but are limited by a slow travel speed of 200’ | 61 m per minute and a limited distance of approximately 60’ | 18.3 m.
Hydraulic Elevators have an elevator pit depth of 4’-6’ | 1.2-1.8 m and require an additional machine room at the ground floor adjacent to the elevator shaft. What is a Hydraulic Elevator? Hydraulic Elevators are lifts that are raised and lowered by a piston that is moved by a pressurized fluid. How deep is the piston cylinder well for a Hydraulic Elevator? 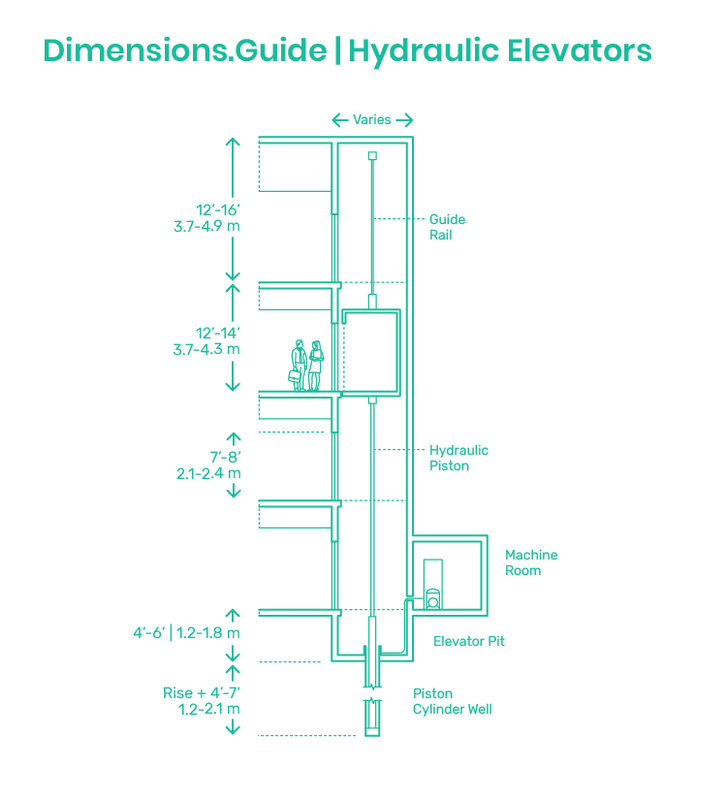 The sheave that holds the piston cylinder well below the floor of the elevator pit has a depth that must be at least the overall rise plus 4’-7’ | 1.2-2.1 m.
What are the best uses for a Hydraulic Elevator? Hydraulic Elevators are typically used for low to mid-rise buildings that don’t have high-speed demands that would be better serviced by a Traction Elevator. Hydraulic elevators have lower initial costs but use more energy and may face larger maintenance costs.